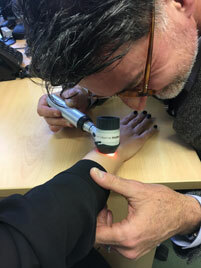 Our Consultant-led Dermatology Service has been running successfully for a number of years and our clinicians have vast experience in effectively treating dermatological disorders. Our General Practitioners with a Special Interest (GPSIs) in Dermatology are Dr Marcus Smith, Dr Mark Robinson, Dr Naveen Rajagopal and Dr Rachael Kay. The Dermatology Consultant overseeing the service is Dr Christina Williams. Skin biopsies/excisions will be referred onto in-house minor surgery clinic.